I have not felt like an activist in years. In truth, I’m not sure that I ever really felt like an activist even though ministry called for it. I couldn’t faithfully preach the gospel on Sunday without taking to the streets on Wednesday to advocate for that hope that had been in my words. While war continued to wage in the Middle East, as it does now, there was a season when I would spend an hour of every Wednesday afternoon in the public square witnessing to my hope for peace. I got to be an outspoken advocate for LGBT equality. That was years ago. Since then, I’ve convinced myself that there wasn’t enough time or that my time could be better spent doing other things. I’ve even told myself that what I was doing wasn’t making any difference at all. I’ve did such a good job convincing myself of this that I didn’t do much of anything. I argued that it was someone else’s fight. I couldn’t lead the change which is what ministry had taught me to do. I still am not sure how to be an ally. It’s lame and I’m embarrassed to admit it, but since I’ve struggled to rise up. Others who would have never imagined themselves to be activists have arisen. They have organized in ways they’ve never imagined. They’ve started to run for office. As the LA Times reports, they’ve fueled the resistance. Maybe you’ve found that same courage. Maybe you’ve risen from the last election with new hope and new determination. Maybe you’ve started to engage in your local ways that you never did before and maybe you’re wondering how not to get overwhelmed with the onslaught of action that days like these requires. Or maybe you’re bit more like me and you’re wading back into an old practice. Maybe it feels different now but there is still something tugging at your heart to rise up. Maybe like me you’re in between church communities or maybe you’ve never had a church community and are wondering what in the world people of faith have to say about activism. If any of these possibilities rings just a tiny bit true for you, then I can’t recommend this new devotional to you. I was thrilled to add this devotional collaboration to my kitchen to remember what it means for me to engage in the struggle for hope, love, justice and peace. It is what we need right now. We need to remember that we are called to such a time as this. We are called to Rise Up. We are called to shape this spirituality for resistance together. Luckily, the work has already begun. A very talented group of people — led by my editor at New Sacred — imagined this 52-week devotional for those of us that hope to rise up from the election, rise up from racism, rise up from the division and hate and do the real work that creates change. In their creative scheming, I got to remember why activism matters to me and why it has always been a part of my ministry and my faith. I contributed three devotions including Hope is a Verb, Come By Here and because my justice seeking has a teeny tiny bit of rage What Am I to Do with my Anger? I have yet to get my copy of this amazing devotional and the t-shirt but as I’m still without an address for a few more weeks, I have to wait. You shouldn’t wait though. You should go ahead and order your own personal copy for $11.95 or better yet get a pack of five devotionals for $35.00. I wrote thinking that these words would be used in one’s personal devotion before venturing out to a protest for Black Lives Matter or for any other act of resistance. I imagined myself needing to read such words after leaving a meeting that made me question why I bother since the meeting did more to frustrate than inspire, but the more that I think about it I think it would be better to read this with other people. Rise Up recognizes that this is exhausting work and it is work that cannot be done alone. It requires something that will ignite us and spur us on and maybe that is best heard in each others voices. Here are just a few ideas. The possibilities are endless. Whatever you do to ignite your hope and faith to keep the resistance alive, I hope and pray that these words bless your good work for much more than one year. Rise up, dear ones. Rise up. I’ve been thinking a lot about hope — where it comes from and how we find it. Because it seems hard to find right now. Any proclamation of hope feels nonsensical. It feels trite and ridiculous. Or worse, it’s so obscure and distant that it’s impossible to claim. I find this unacceptable and it seems to be most of what I hear. What good is the possibility of hope if you can’t imagine it in your own life? What good is the promise of good news if it seems to come to everyone else but you? I would say: diddly squat. And yes, there are terrible things in the news. There is so much violence and destruction but it’s not the headlines that have me thinking about this possibility of hope. It’s the church I’m pastoring. I am their interim pastor. I am walking with them through a season of ministry where everything is uncertain and unknown. I’m wondering with them about what ministry looks like in a rural community where nothing much seems to change. It’s all fine and good to say that there is hope for the church. I would tend to agree. There is lots of hope for the church universal — but what does it look like for this teeny tiny church in the countryside? I don’t tend to post my sermons here but this one is still working on me. I’m not writing anymore. I’m not editing the words that I preached this morning from Micah 5:2-5a and Hebrews 10:10-15 but they are challenging me. We’ve spent most of Advent in this church asking questions inspired from the prophets. This week is no different. There is a question at the heart of this sermon that I’m still trying to answer. It isn’t resolved yet. Perhaps because Christmas hasn’t come yet. There is part of me that wants so very much to expand on those last two paragraphs because it feels like there is more there. There is more to be said as hope is born. So here is a sermon about that hope that is coming. Imagine that time before the old agreement, before there was a new plan to replace the old. Imagine, if you can, such a time and such a place where there is no need for anything new. There is no technology or theology to be improved. It is just the people in their old ways looking for love, hope and peace. Imagine a time when you and your clan are without a home. You’ve been pushed out and left in the wilderness. You can’t go to the temple. You can’t worship as you always have but it’s what you want most. When everything is so new and terrifying, you and your clan want nothing more than to worship. Did their worship change because their situation changed? Did their relationship with God change because that was God’s will? Or is this just how change happens? Do our old habits always give way to new ways of worshipping and living and hoping? Aren’t we always hoping for more? Micah speaks to exactly that desire. To displaced, confused, wandering people who know more violence than peace, he gives them hope for something more. Something more than what they’ve known. Something more than what they’ve seen. Only God can deliver this future that is more than what we’ve known and more than what we’ve seen. Only God can imagine such a future without being too bogged down by our sins. As the birth of hope is so very close, coming we hope this very week, we might not want to talk about our sins. But, we must. We have to talk about this for just a moment because these five verses in Hebrews demand it. Imagine that time before the old agreement, before there was a new plan to replace the old. Imagine, if you can, such a time and such a place where there is no need for anything new except for the fact that everything has changed. Nothing is as it was so that everything around us is changing. And we bellyache. We moan. We protest. We demand God for hope and this is our sin. As Sister Simone Campbell told Krista Tippett on American Public Radio’s OnBeing, “our sin is our obsession with security.” We have so convinced ourselves that “everything ought to work out perfectly for us. That we ought to have every conceivable drop of oil ever that we’d ever need any time. That we have to have electricity…” she goes on. There is a long list of those things that we need and want. We think that our hope will come from these things, these little guarantees from the long list of our needs and wants. But, hope does not come from a place of security. Hope comes, instead, from the wild surprises that God continues to point us toward. So, let’s get specific about where and when and even how we see hope being born. For that hope will not only be born in a stable in Bethlehem. Micah assures our displaced, confused, wandering hearts that this hope —God’s hope — was not a one-shot deal. It is a hope that is always coming to birth. Again and again, God surprises us. God’s hope shows up in unexpected places asking us to believe that it’s possible. Imagine that hope has a name and a face. Imagine that it have a body. Maybe even your body. Imagine that you could be faithfully obedient to that hope within you. And that it could so change what you know to be true and what you see in the world around you, that hope within your body. Or maybe not your body. Maybe you don’t feel it inside you but it has another name and another face. Yes. Let’s get specific. Let’s pinpoint the exact where that hope is being born right now. Let’s not talk about vague possibilities or warm feelings but ask ourselves this: where exactly is hope being born right now? Does hope have a particular name and face? Does this hope being born have a body that doesn’t fit with our expectations? Is hope in this time and place found in a Syrian refugee or the Mexican immigrant wandering in the desert as Mary and Joseph did so many years ago? Is the hope that might change all that we know being born in Paris right now? Or will it be found in a Muslim woman’s eyes blinking through the hijab that otherwise hides her face? Or is hope coming right here on Ridge Road? Get specific. Pinpoint exactly what it is that you God see doing for God has promised that this hope is not a one-shot deal. It is always coming to birth. The question is: where do you see the surprise of hope? I found myself today in one of those online conversations with a bunch of other clergy. I had asked for wisdom or a prayer. Or something else entirely. I’m still not sure what I put out there into the interwebs. To that posting, I got some feedback that I needed and some that frustrated me. I edited my reply not once but three times before I hit send to the powers on Facebook. The first version was snippy. The next edit was evasive. And the third concluded with these words that I made into an image on Canva. (Because obviously that’s what one would do when procrastinating on writing a sermon.) I don’t know where the hell they came from but they speak to me. They offer a truth that I’m trying to hold onto as I consider all that’s ahead in my vocation. I have so much hope tangled up and strangled by doubts, fears and concerns. I can only hope that my hope is stronger. Maybe you’re praying the same thing today. For you, for me, for the whole freakin’ world, may it be so. 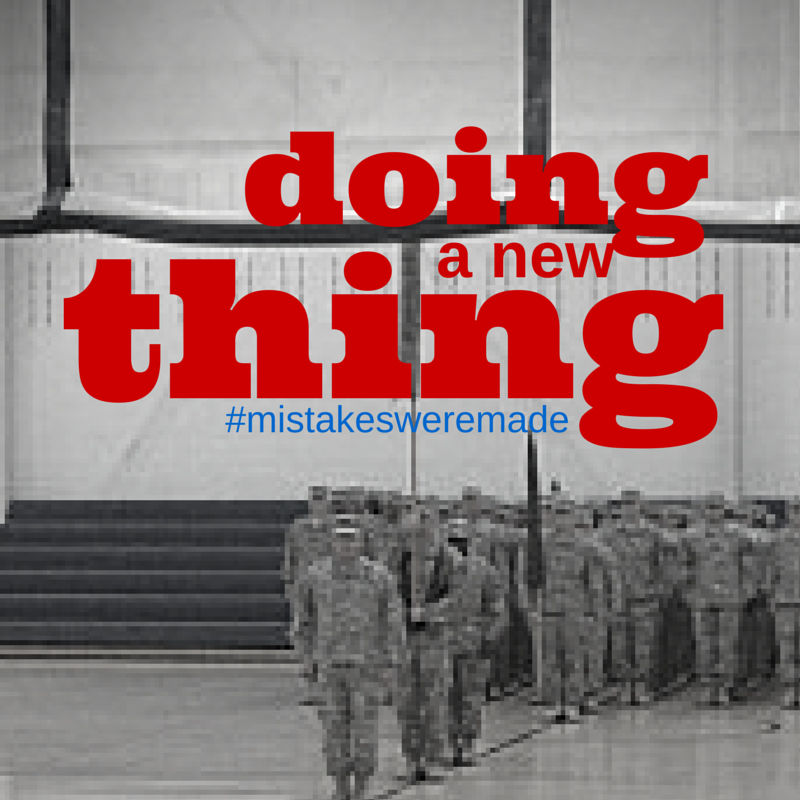 There is a saved draft of a new post as part of my series about Doing a New Thing in this military ministry that I’m imagining. There are lots of things that I’m eager to share and new things that I’m eager to try — but I’m not yet ready to hit publish that particular post. Instead, in this post, I’d like to invite you to be conspirators and collaborators in this possibility. On Sunday, at the Central Atlantic Conference of the United Church of Christ, I heard Cameron Trimble of the Center of Progressive Renewal preach an inspiring word where she asked the gathered body:When was the last time you were as passionate about your faith as you were about your donuts? She had shared a testimony to the abiding power of donuts especially after being with another conference that celebrated their local donuts over another competing baker. It was hysterical and ridiculous. You had to wonder where she was going with this — until Cameron asked this question. When was the last time you were as passionate about your faith as you were about your donuts? Just the evening before I had dinner with a bunch of colleagues in the UCC 2030 Clergy Network who were excited and curious about what I was doing — but I wasn’t ready to make a pitch. I wasn’t ready for their enthusiasm and curiosity. I was just too darn tired after a long day of meetings. I could have had this amazing opportunity to share this possibility with a group of people who were eager and excited but I didn’t. I missed my chance. I don’t want that to happen again. I don’t want that to happen to me or to anyone else so I want to invite you to become part of this possibility. Because none of us can do this alone. We need each other to realize the crazy things we hope to do for God’s people. So, help me get the word out. Share this video with everyone you know. Share it on Twitter and Facebook. Share it on your blog. Post it anywhere you can think to add it. There are amazing chaplains in the military right now — but so few of them are progressive. So few of them are able to provide a sacred space for tough questions that doesn’t insist on a narrowly Christian perspective. There are rules against it but there are too many stories like this one. We need a progressive voice for the military community. As churches sell their buildings and religious structures of every shape and kind adapt to meet the needs of a changing world, why shouldn’t that innovation come within the military community as well? Why shouldn’t there be an open table for our service members of every faith and no faith to do the holy work of building progressive community? I admit that I get stuck in my Christian language as much as the military community stumbles over acronyms — but this is my hope. It’s a community Beyond Acronyms. It’s a community that hopes together, prays together and gathers together. It’s beyond any one military branch and even beyond the internet — though that’s where it’s starting. I believe we need this. I believe this kind of progressive ministry is necessary for the kind of people we hope to be. I get excited just writing these words. I’m much more excited about this than I am about donuts — and I hope you are too. Help me get the word out and share this video. God comes to be what we cannot. That is the hope and it is this hope that does more than justify but moves our worship and praise. So it is this possibility — this concept of hope — that stirs these prayers today. Not a hope soaked in blood or weighed down in suffering but a hope that was born on Christmas, a hope that lived and breathed, that dined with sinners and cried with mourners — a hope that continues to be created over and over again. Here is a place to raise our hopes. Here is a place to boast in what God can do. Here, we come to find our strength every morning. so that we might even soar on eagle’s wings. Here, in this place, God will raise us from death to life. We were saved in hope. We are saved by the love God proves for us. We are saved by the peace God gives to us in Jesus Christ. and can barely describe it. For, if we see what we hope for, that isn’t hope. Who hopes for what they already see? like those who have still have a dream. We wait in patience because we know that God hasn’t given up. God is always resurrecting hope. And it is this hope that saves us. The prayers in our worship this morning were written by/adapted from Liturgical Lights for Sunday May 10, 2015 by the Rev. Elsa Anders Peters. Elsa is an ordained minister in the United Church of Christ who blogs at revelsaanderspeters.com.